After announcing that it would move to an algorithm-based feed earlier in February, Twitter recently began rolling out a button to users on its iOS app that allows them to provide feedback for tweets on the social network (via BuzzFeed). Through the "I don't like this Tweet" button, Twitter will eventually learn to showcase less tweets related to the content you flag as poor in its algorithmic feed. Twitter began introducing its algorithmic timeline in February, putting its selected tweets in a prominent placement on the user timeline, atop the reverse chronological organization of regular Tweets that the social network has been known for before the update. Users can choose to turn the feature off, but according to Twitter only 2 percent of its user base has done so since the update debuted. Doesn't work, I keep hitting the "I don't like this tweet" button on all ads but they continue to show up. I click the "this offends me" safespace feature for both Clinton and Trump ads. Yet, they still show. They really need to throw all of these new features in the API. I wish they would spend as much effort fixing the Mac app, which continues to have bugs. Meh... Twitter is full of even more hate than Facebook, this will not be a solution but good start. Quick! To your safe space! Is there a Select All feature that comes with this? Would be handy on Mondays. I'm a 2% then because I turn off the algorithm as quickly as I could google it. I want my tweets in order. I want my facebook in order. I don't need or want a corporation telling what is and isn't important. That whole showcasing of tweets thing annoys me to no end when I visit the website of my Twitter feed and because I use Tweetbot on iOS I never use the Twitter app. 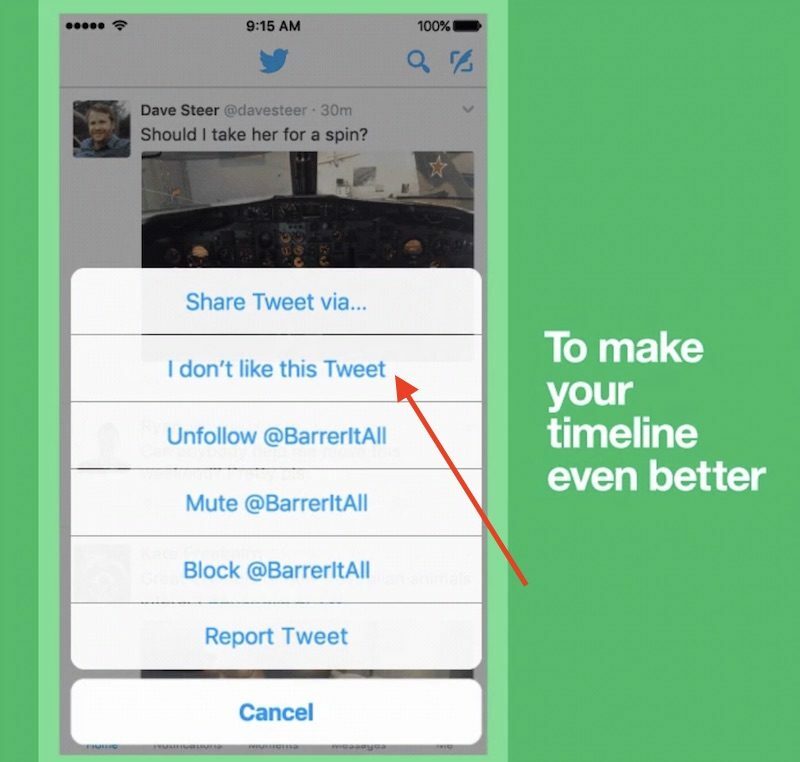 If tweets are not displayed in chronological order it's not really a "timeline" anymore, is it? It's more a ... 'time squiggle'. Unless you're Doctor Who or Bill & Ted or something.